This might occur when the ID or password is mistyped, authentication server is mistyped or incorrect, or blocked by your security device such as firewall. Resolution : to check, follow the instruction below. 1. Make sure the ID and password is entered correctly. 2. Go to Start > Run > “cmd” > enter “ telnet auth.startsupport.com ”. 3. If the connection is available, screen will be cleaned up. Press Enter to go back to the prompt. 4. If the connection is not available, an error message will be prompted on the screen. Contact your network administrator to allow connection to “auth.startsupport.com ” on port 443. 5. Repeat #2 – #4 for “ www.startsupport.com ” and “ authus.startsupport.com ”. 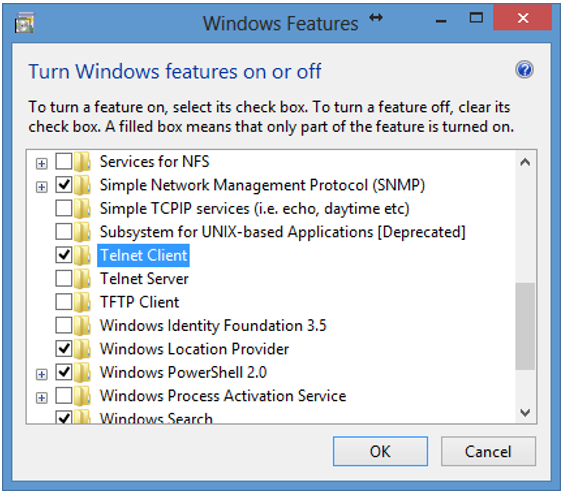 NOTE : to enable TELNET client, select the option in Control Panel > Program > Windows Features.